Do you need help with garden clearance in Leytonstone or the surrounding E11 area? Look no further than Away With It! For more than a decade we’ve been delivering garden clearance Leytonstone home owners count on and cheerfully recommend to neighbours, family and friends and colleagues. They really love our speedy, flexible services and economical prices. And we believe you will too! 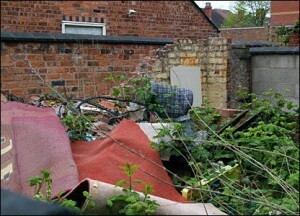 Garden clearance is a back-breaking job and then there’s all the hassle of getting rid of your garden waste. Away With It garden clearance services make everything easy as pie. Our experienced and efficient staff will clear all of your garden rubbish in no time at all. And for a lot less than you might think. Organic waste such as branches, hedges, leaves, grass and soil. Outdoor storage sheds, coal bunkers, garden greenhouses, patio slabs, walls, fencing, posts and any garden structures. And we will sweep and rake up after the job is done, leaving your garden neat and clean. We supply a quick, on demand removal service. When you need us we are just a phone call away. We are a local company and are open for business 7 days a week from 7am to 11.30 pm. Evening and weekend bookings can always be organized for your convenience. We are fully licensed and insured waste carriers. You can depend on us to perform an entirely professional job and handle all your waste in the right manner and dispose of it lawfully. Bookings are made it two hour slots and we’ll always call in advance tell you know when we’ll be getting there so you’re not left hanging. Our simple pricing means there won’t be any unpleasant surprises when the work is concluded. The price we quote is the rate you will pay without any hidden add-ons. To discuss your needs for garden clearance Leytonstone with a member of our experienced team call us today on 0208 504 7390. We’re available 7 days a week from 7am to 11.30 pm to take your call. Our professional personnel will be delighted to answer your questions and offer an economical free estimate. Or you can submit your particulars using our easy request a quote form and we will answer you fast.